Qualify for Kona Ironman and to complete a marathon in each state and one in the other 6 continents. It’s fun. It gives me energy. Great meditation time. Oh and the cute girls make me want to run more. 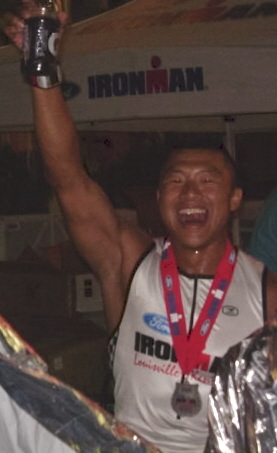 Kona 2004. It was my second year of running. I trained 6-8 weeks. 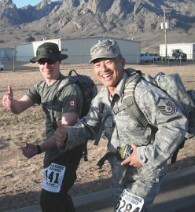 Run into my 1st Sgt when deployed in 2003. Forgot my watch at the hotel but still got a PR of 3:49. Made a wonderful friend Jill and she has been feeding my Ironman dream. I ran with a pace group 3 times and it’s been so fun. Because I like to have fun, tell a few jokes, play some trivia and I love to take pictures. Prepare to have fun. Leave your headphones at home. If you are not having fun, I think you are doing something wrong. Christian youth camp. I enjoy being a mentor and teaching our leaders of tomorrow.